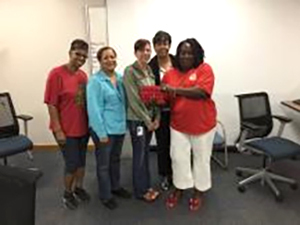 CWA AT&T Internet members at the Metairie, La., NIC Call Center join mobilization training. CWA members voted an overwhelming 92 percent "YES" to authorize a strike if a fair contract can't be reached with AT&T Internet. The 2,000 Internet Services Contract members work at call centers, supporting customers, and as technicians. Bargaining is tough, with AT&T taking a hard line against workers' key bargaining issues including a fair increase in wages and benefits. The contract expired on July 23; the contract has been extended and negotiations are continuing.